This is a blog about me and my activities, not soup to nuts though because I don't go near the kitchen. I know it has been a long time since I have blogged. Part of the reason is nothing interesting has happened and another thing is too much has happened. I spent two weeks in Brooklyn because Gretel broke her foot and had to have surgery. She broke it at a quilt retreat. (Hubby said we should do something less risky, like sky diving.) 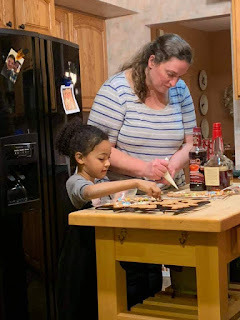 I had a good time with Molly and even did a little cooking! After a came back I spent a week in Ohio because Mary's school district did not have the same break as Sofie's. I have a whole new respect for Taekwondo. It really teaches kids to listen. I came back from these excursions in time for another quilt retreat. This one was very pleasant and uneventful. I have been working on several charity quilts. I don't belong to a guild so I am not under an obligation to make them, but my friend, Linda, is in charge of the Charity committee for a quilt guild so I help her out a little. 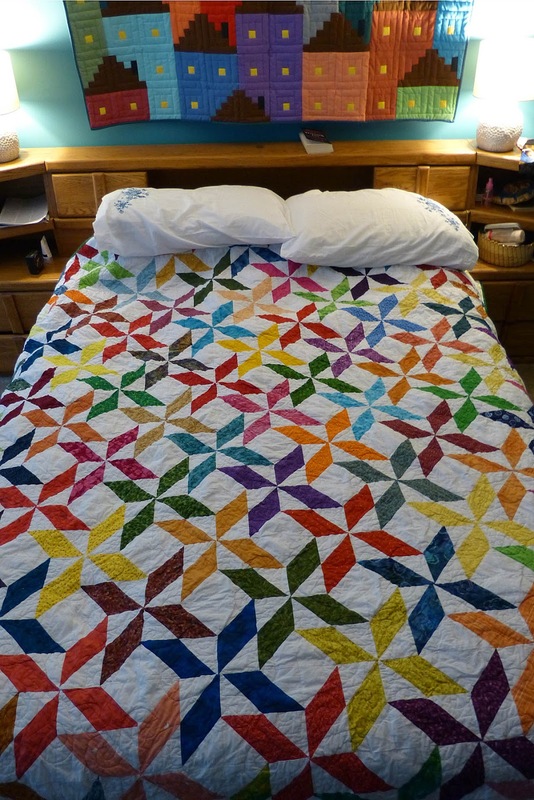 These quilts are made mostly from my scraps and I machine quilt them. In my opinion, hand quilting is much easier than machine quilting. It does take LOTS longer. Hand quilting hurts your fingers, machine quilting hurts your shoulders. Hand quilting is more forgiving of uneven piecing. The first two quilts have machine quilting which is nothing short of embarrassing, probably because my piecing and more likely my backing was not even. The third is going very well. I used a wide backing and a batting that was very flat. I also took my time. The machine can go quite fast and it is easy to get wobbles. I am hoping that tonight Hubby will set up my quilt frame and I can begin quilting my storm at sea. For Christmas Santa got me the stove and sink for my kitchen. I already had the refrigerator. Now I have to make some curtains. I was thinking cafe curtains might work. With all the windows it is hard to find space for the appliances. This is the refrigerator that I had. Hubby is helping me glue the pipes into the ceramic. It was hard to find a spot on the wall big enough for it. It will have to go on an interior wall because there isn't a space between windows big enough. I also have to mount it to the wall as it only has two legs. Here is my stove and it just fits between the windows. 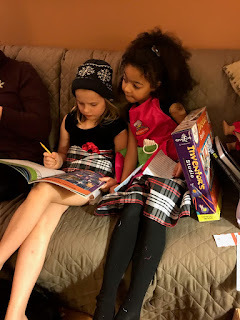 Christmas was busy and wonderful. Five of the seven kids were able to come with five of the eight grandchildren. Hubby did a fantastic job with dinner, pork roast. Martha made deviled eggs twice because Mindy ate much of the first batch. Gretel made an appetizer with pork and chicken sausage and phylo dough. It was incredible. Mary made dessert, both a trifle and a pavlova. We ate quite well. On the 26th my brother and his wife and daughter came for lunch. It was just a nice holiday. The shopping is done. The pillowcases are made. All the presents are hidden in Grandma's closet. I think I know where everyone is sleeping. Hubby is working out the menus. Even the dog goes for a bath tomorrow. I think I am almost ready. For the last Lions Club meeting of the year, we invite Lion Roger who grows chestnuts in Michigan , to roast chestnuts as a treat for us. 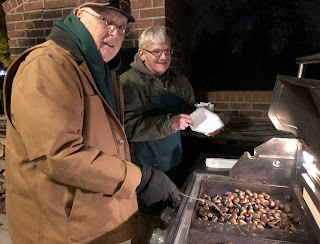 Usually chestnut roasting night is the coldest night of the winter as we huddle around the fire and eat chestnuts and drink mulled wine. But this year the weather was quite warm and we all had a good time. the quilting. The solid green paisley showed every bobble vividly. So I used invisible thread to solve that problem. It did. After I washed the quilt things looked a lot better. The quilt is 96 by 96 so it is large and I must admit I prefer the hand quilting, both for the look and the process. I plan to give this quilt to Amy. At my brother's suggestion I started a new blog which is an archive of the quilts which I have made. I tried to do the most recent showing first and going back to my first.Their are 82 entries which mean at least 82 quilts, some though have more than one on an entry. I guess I have been busy. The blog is called Quilts I have Made. I am a retired electrical engineer. I am the 5th generation to live in Detroit. My hubby, dad, brother, uncles and cousins and I all worked for the auto industry. I hate to cook! I like anything to do with a needle, not for shooting up but for pulling thread. Two of my daughters have a blog and I decided I wanted one too. My hubby said no one would read it.